Do you use spf13-vim? Leave a review! The distribution is completely customisable using a ~/.vimrc.local, ~/.vimrc.bundles.local, and ~/.vimrc.before.local Vim RC files. 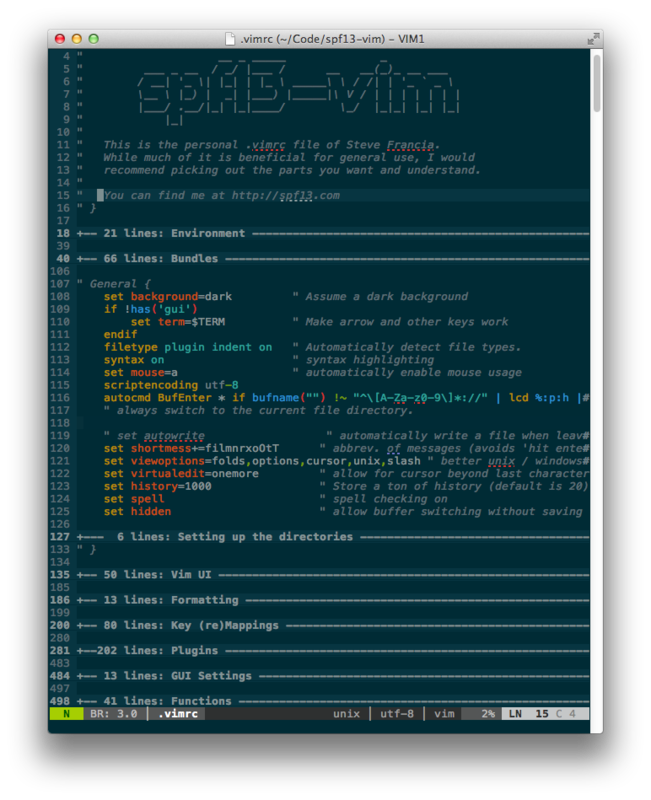 Unlike traditional VIM plugin structure, which similar to UNIX throws all files into common directories, making updating or disabling plugins a real mess, spf13-vim 3 uses the Vundle plugin management system to have a well organized vim directory (Similar to mac's app folders). Vundle also ensures that the latest versions of your plugins are installed and makes it easy to keep them up to date. To make all the plugins work, specifically neocomplete, you need vim with lua. 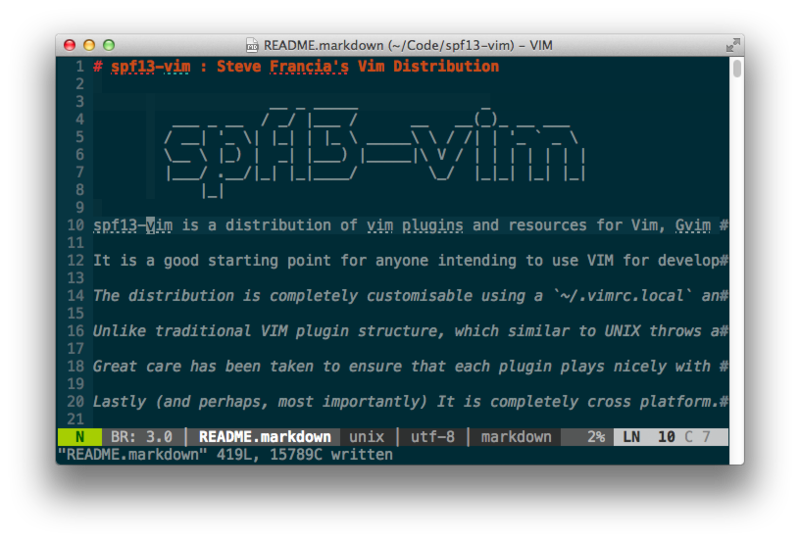 Note: The spf13-vim package will install Vim also! If you want to install msysgit, Curl and spf13-vim individually, follow the directions below. After the installation of Vim you must add a new directory to your environment variables path to make it work with the script installation of spf13. Then you need to add it to your environment variable path. After that try execute vim within command prompt (press Win-R, type cmd, press Enter) and youll see the default vim page. I'm always happy to take pull requests from others. 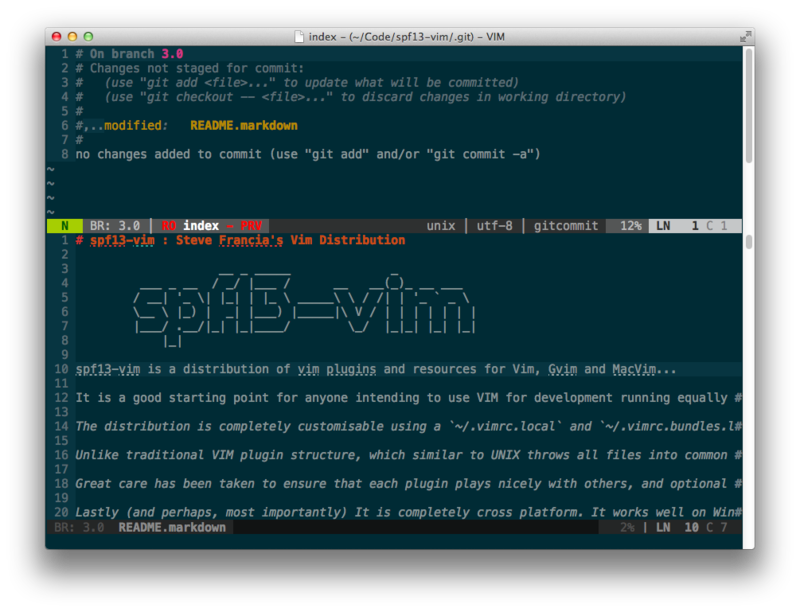 A good number of people are already contributors to spf13-vim. Go ahead and fork me. 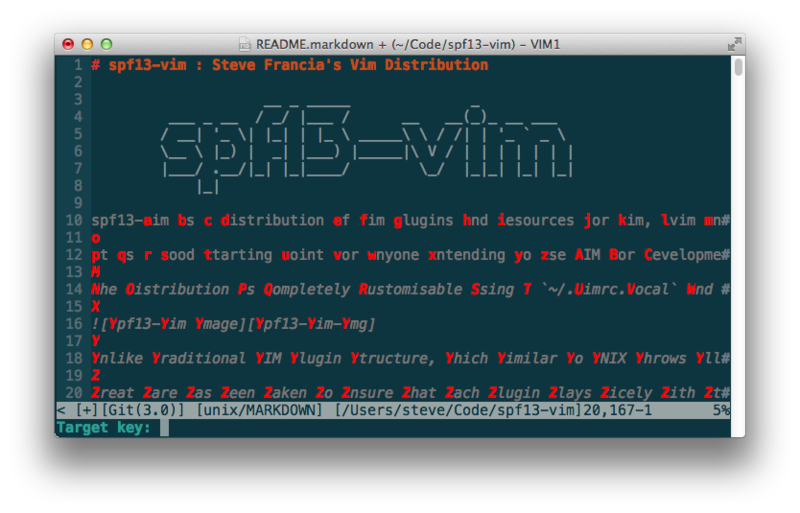 Create a ~/.vimrc.before.local file to define any customizations that get loaded before the spf13-vim .vimrc. For a list of available spf13-vim specific customization options, look at the ~/.vimrc.before file. See .vimrc.bundles for specifics on what options can be set to override bundle configuration. See .vimrc.before for specifics on what options can be overridden. Most vim configuration options should be set in your .vimrc.fork file, bundle configuration needs to be set in your .vimrc.bundles.fork file. You can specify the default bundles for your fork using .vimrc.before.fork file. Here is how to create an example .vimrc.before.fork file in a fork repo for the default bundles. Once you have this file in your repo, only the bundles you specified will be installed during the first installation of your fork. For an example of a fork of spf13-vim that provides customization in this manner see taxilian's fork. <Leader>ev opens a new tab containing the .vimrc configuration files listed above. This makes it easier to get an overview of your configuration and make customizations. 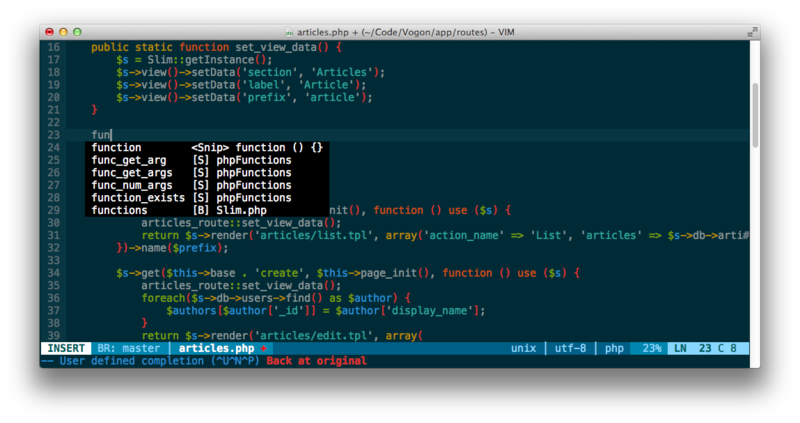 <Leader>sv sources the .vimrc file, instantly applying your customizations to the currently running vim instance. Once new plugins are added, they have to be installed. Create ~/.vimrc.local if it doesn't already exist. Add the UnBundle command to this line. It takes the same input as the Bundle line, so simply copy the line you want to disable and add 'Un' to the beginning. 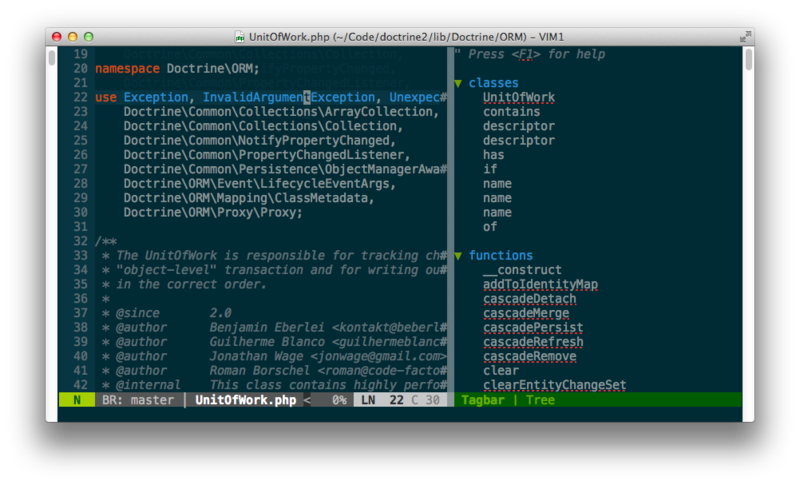 NERDTree is a file explorer plugin that provides project drawer functionality to your vim editing. You can learn more about it with :help NERDTree. This plugin is a tool for dealing with pairs of surroundings. Examples of surroundings include parentheses, quotes, and HTML tags. They are closely related to what Vim refers to as text-objects. Provided are mappings to allow for removing, changing, and adding surroundings. Neocomplete is an amazing autocomplete plugin with additional support for snippets. It can complete simulatiously from the dictionary, buffer, omnicomplete and snippets. This is the one true plugin that brings Vim autocomplete on par with the best editors. <C-k> for completing snippets using Neosnippet. YouCompleteMe is another amazing completion engine. It is slightly more involved to set up as it contains a binary component that the user needs to compile before it will work. As a result of this however it is very fast. To enable YouCompleteMe add youcompleteme to your list of groups by overriding it in your .vimrc.before.local like so: let g:spf13_bundle_groups=['general', 'programming', 'misc', 'scala', 'youcompleteme'] This is just an example. Remember to choose the other groups you want here. Once you have done this you will need to get Vundle to grab the latest code from git. You can do this by calling :BundleInstall!. You should see YouCompleteMe in the list. Do you want clang support (if you don't know what this is then you likely don't need it)? Do you want to link against a local libclang or have the installer download the latest for you? Do you want support for c# via the omnisharp server? The plugin is well documented on the site linked above. Be sure to give that a read and make sure you understand the options you require. For java users wanting to use eclim be sure to add let g:EclimCompletionMethod = 'omnifunc' to your .vimrc.local. Syntastic is a syntax checking plugin that runs buffers through external syntax checkers as they are saved and opened. If syntax errors are detected, the user is notified and is happy because they didn't have to compile their code or execute their script to find them. AutoClose does what you expect. It's simple, if you open a bracket, paren, brace, quote, etc, it automatically closes it. It handles curlys correctly and doesn't get in the way of double curlies for things like jinja and twig. QuickStart CTRL-] while the cursor is on a keyword (such as a function name) to jump to its definition. Tip: Check out :help ctags for information about VIM's built-in ctag support. Tag navigation creates a stack which can traversed via Ctrl-] (to find the source of a token) and Ctrl-T (to jump back up one level). To enable powerline symbols first install one of the Powerline Fonts or patch your favorite font using the provided instructions. 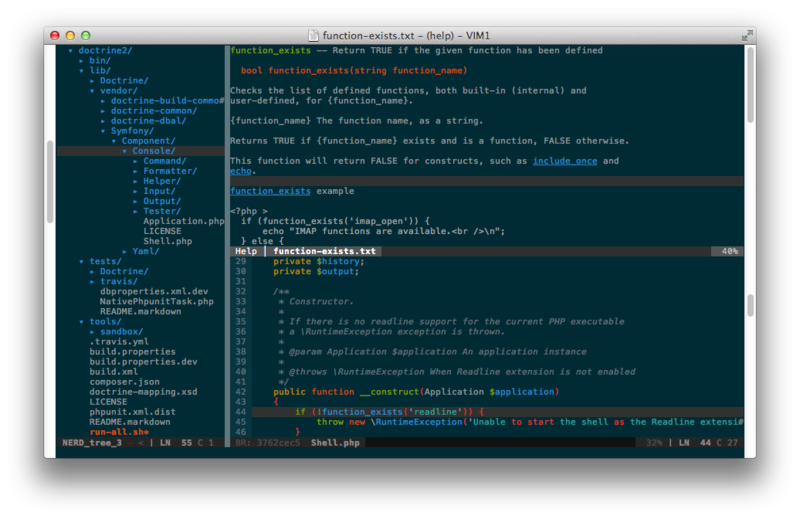 Configure your terminal, MacVim, or Gvim to use the desired font. Finally add let g:airline_powerline_fonts=1 to your .vimrc.before.local. It also contains a very complete set of snippets for use with snipmate or neocomplete. over 2 years ColorSchemes, what folder to add them to? over 2 years Should customized bundle configuration be defined in .vimrc.bundle.fork? over 2 years could you please to intergrate the plugin asyncrun.vim for vim 8 ? over 2 years How to get rid of "private member variable must be prefixed with an underscore" warnings? over 2 years How o specify the location of the configuration? over 2 years How to disable underlined words? over 2 years "vim-scripts/restore_view.vim" conflict with "bling/vim-bufferline"
remove 'luochen1990/rainbow' plugin to fix "magic" syntax highlight. How to uninstall spf13 Vim distribution? Keep up with changes to spf13-vim! Would you tell us more about spf13-vim?